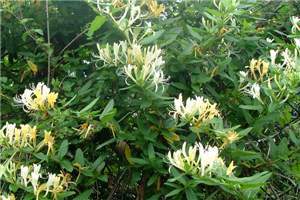 Originating in China and Japan this robust climbing or scrambling shrub to 8 m high is another garden escapee. It suckers and can form large mats on the ground and huge masses in the canopy of trees. 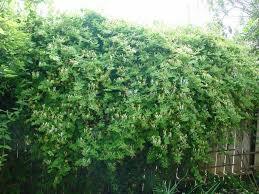 It smothers trees and shrubs and can restrict sap flow in the soft barked plants it grows around. It can also cause premature deterioration of fences and buildings. Stems tend to be purplish and hairy when young, becoming woody with flaky bark on mature stems. Leaves are bright green and hairless except for hugging hairs along veins and margins. 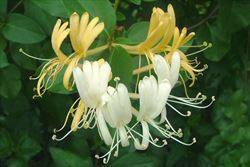 The white, ageing cream to yellow coloured flowers are in pairs near the branch tips, flowering from Autumn to spring. 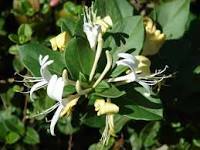 Flowers have a strong, sweet scent. The fruit is a shiny black berry. Both leaves and berries are toxic. Dispersal is mostly by seed, however it tends to spread more through branches taking root when contacting the ground. Dumped garden waste and contaminated soil contribute to its distribution too. Strangely enough it is still widely available at markets, fetes and nurseries, despite it being a documented weed on the Coffs Coast. Control is by digging it out - plant and all roots. This method reduces site disturbance and allows more specific selection of species as opposed to spraying. Ensure that as much of the root system is removed to reduce the amount of regrowth. The cut & paint method can also be used where the vines are cut off at ground level and again about a metre high and immediately painting both ends of the stem with undiluted product. This is useful for larger plants which cannot be easily removed by hand.